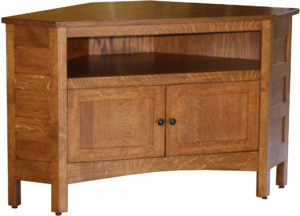 Transform a corner of your living room or den into the entertainment hotspot in your home with one of our Amish Corner Entertainment Centers. Because at Weaver Furniture Sales, our Amish artisans design and build corner plasma TV cabinets to maximize space while offering plenty of room for your media storage. 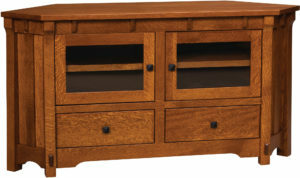 What’s more, the Midwest’s finest Amish artisans build each corner TV cabinet. And they use select hardwoods plus old-world cabinetmaking practices. So the unit you take home will be very sturdy and long-lasting. Plus timelessly beautiful. Browse our sizable online collection. And choose the one that’s just right for your home. Or, visit our ‘brick and mortar’ store in Shipshewana, Indiana, and see our entire collection first-hand. 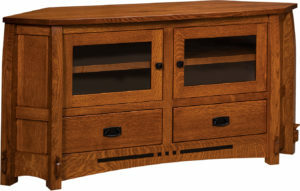 We are delighted to offer a huge collection of solid hardwood corner television cabinets. 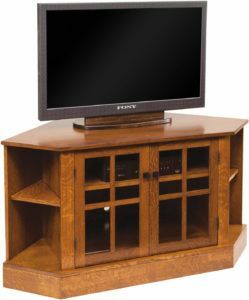 So if you’re looking for a smaller size TV cabinet, check out something like the Bungalow Small Corner TV Stand. Interested in a full-size corner entertainment stand? 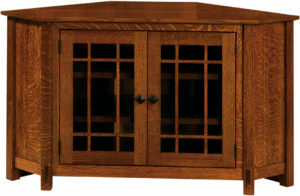 Then, look into the Jackson Shaker Entertainment Center. Or, you may go for something in between. What’s more, you can select a unit as shown. Or give us your customizing wishes. Like wood specie, finish, hardware and the like. 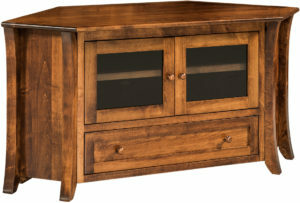 And we will create the corner television stand you’ve been longing for.